Each month I'm going to be doing a round up of the new books we have read over the month. I Love reading to Lily and I read to her every night before bed. We have a lot of books and I could easily read new ones to her every night but I find the repetition of them being the same books really help to relax her and doesn't get her to excited. That being said it would drive me even more insane to read the same books for a entire year and so I plan to try to introduce at least four new books into our bedtime reading each month. As crazy as it drives me we are still reading some of lasts months which you can see here. Four books a month doesn't have to be a costly thing by the way, you can pick up some really good books from Poundland or The Works. Here are this months new selection of books and what we think. This is our new favourite book. I have read it so many times that I actually don't need to look at the pages to be able to read it to her. It has a really good rhyme to it which makes it so pleasant to read and flows so well. The story is about a animal dance off and all the animals get together and dance. Poor Gerald the giraffe isn't very good at dancing and he gets mocked by the other animals. But the story ends on a really good note where he finds the right type of music and actually manages to pull off some amazing moves. This book you can pick up from most leading book stores and I would really recommend it. This story is quite humorous and if you have a child who loves anything about space and aliens then this is a great one for them. The story is all about a mum teaching his child some manners by saying you don't just take the last chocolate chip cookie, you offer it around first. After offering it to everyone, even a alien who tries to eat him instead, he finally gets his cookie but at a cost, as its now gone all icky from being in his pocket. The images in this book I love, they are so bright and wacky and really cartoony. Its a really fun story overall and I enjoy reading this to Lily. Lily loves stories with different animals in, and this one features lots of different ones as monkey swings around annoying everyone. The story has a nice bit of repetition which we like and you keep saying STOP MONKEYING AROUND. Sad little story to start as no one wants to play with the cheeky monkey. But happy little ending as he finds a new friend. This one isn't Lily's favourite and some days she won't want to listen to it and others will quite happily listen. Seen as Lily has her new obsession with Peppa Pig, this story has been one we had to introduce this month. Its short and sweet with a sentence on each page so a good one to read in between the longer stories. Always lovely to read a story about mummies to, and this one is all about what mummy pig is good at. With it being a hard board book its a great one to give to Lily to read by herself also. We have started two of four new books for our may monthly round up and can't wait to tell you about them. Which of the four books above do you like the sound of the most? The Last Chocolate Chip Cookie!! 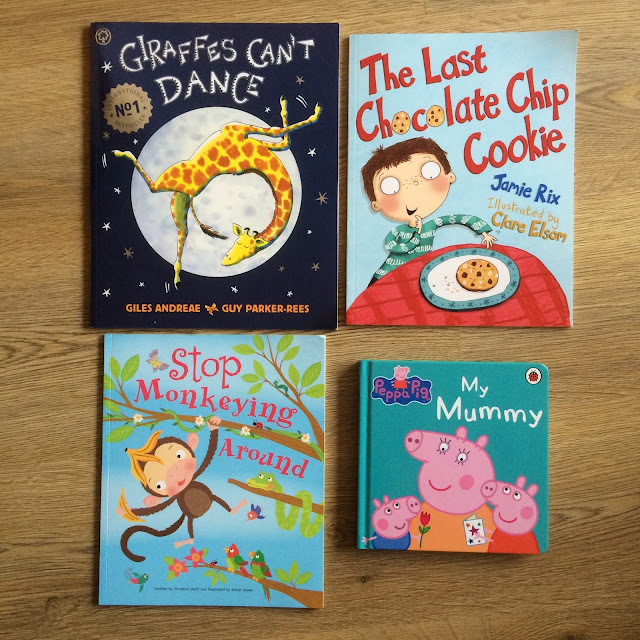 Such great books, my children are getting a bit old for these now, at 6 and 9 but Giraffes can't dance is n old favourite! Fabulous picks! I'm sure my niece and nephews would love them! Great choices. Keep reading books with the kids. Fun and educational! So Giraffes Can't Dance has caught my attention and I think this would be brilliant for my nieces! Peppa Pig, My Mummy:- Sounds lovely. Nice to acknowledge good things / aspects. Thinking I'll look out for this one, might be nice as a gift around timing of Mothers Day.